Digital UltraViolet and Digital Copy will makes it possible for you to stream the movie Ant-Man & The Wasp HD UV or iTunes Code via MA instantly to your computer and compatible Smartphones, Andriod, iphone, iPod Touch, iPad and tablets devices anytime, anywhere. 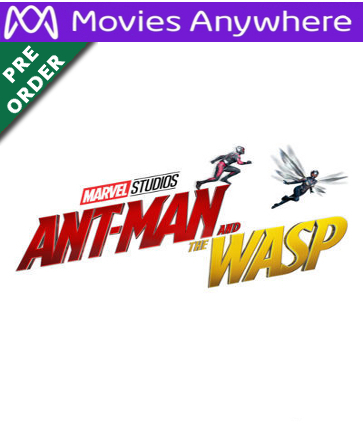 You can also download a Digital UltraViolet Copy or a Digital Copy of the movie Ant-Man & The Wasp HD UV or iTunes Code via MA to your computer and compatible devices. The latest film in the Marvel juggernaut of blockbuster motion picture entertainment, �Ant-Man and the Wasp� wisely allows super-heroics to take a backseat to comedy, and gives the audience a chance to catch its breath after the almost overwhelming non-stop intensity of �Black Panther,� �Avengers: Infinity War,� and even the adult-oriented �Deadpool 2,� all released earlier this year. Only the tenth picture in the �Star Wars� series since 1977, �Solo� is the first film in the franchise�s history to fail to earn back its budget costs even after five weeks in wide release. By comparison, �Ant-Man and the Wasp� is the twentieth picture in what is known as the Marvel Cinematic Universe, and the fifty-third movie since 1989 based on a Marvel-based comic book. A sequel to both 2015�s �Ant-Man� and 2016�s �Captain America: Civil War,� �Ant-Man and the Wasp� reunites most of the cast of the 2015 picture. Former petty thief and ex-convict Scott Lang escapes from house-arrest to team again with physicist Hank Pym and his brilliant daughter Hope van Dyne and assume his identity as the miniscule superhero Ant-Man in an effort to rescue Hope�s mother from her imprisonment in the molecular quantum realm. The trick to enjoying a movie like �Ant-Man and the Wasp��or any picture in the Marvel Entertainment Universe, really�is to not allow yourself to be too impressed with the science: It�s all theoretical, which essentially means that nobody understands it any better than you do. This is the kind of stuff the guys talk about on television�s �The Big Bang Theory.� And the filmmakers use it in the Marvel pictures as a sort of distraction, to get you thinking about something else while they�re cooking up a big surprise for you in the next scene. In the case of �Ant-Man and the Wasp,� the result is nearly a satire, a comedy which seeks to make some fun of the gravity and ponderous self-importance of the other movies in the Marvel series. Ignore the science and the technical terms, and even the story: This is what a Marx Brothers comedy would�ve looked like if somebody had given Groucho and the boys a $200 million budget and the services of the most talented special effects craftsmen in the world. As in the earlier �Ant-Man� picture, the comic actor Paul Rudd is a lot of fun as the hapless Scott Lang, doing as well as he can to be a good role model for his adorable daughter while still housebound with an electronic monitor locked to his ankle by government authorities, a result of the events depicted in �Captain America: Civil War.� The Canadian-born actress Evangeline Lilly is simultaneously effective and impressive as Hope van Dyne, Scott�s estranged love interest and occasional rescuer. Lilly, who also appeared as the elfin Tauriel in Peter Jackson�s �The Hobbit� trilogy, possibly used her experiences in those pictures as a warmup for her size-shifting acrobatics here. Likewise, old pros Laurence Fishburne and Michael Douglas are more fun than they�ve ever been, playing old friends and professional rivals, a sort of Hope and Crosby for the new millennium described by director Peyton Reed as having been partially modeled on competing computer geniuses Bill Gates and Steve Jobs. At one point in the narrative, through the miracle of computer-generated imagery Douglas plays a scene as he appeared at around the time of 1972�s �Napoleon and Samantha,� a Disney picture from the very beginning of his career as an actor. The results are astonishing�and even a little scary. Also appearing in the cast are Hannah John-Kamen as an unstable victim of quantum science, a wonderfully clueless Randall Park as Scott�s parole officer, and Abby Ryder Fortson as Scott�s patient, understanding, and tolerant young daughter. Marvel Comics pioneer Stan Lee contributes his customary cameo. And Michelle Pfeiffer appears in a few scenes during the picture�s final quarter as Douglas� wife and Lilly�s mother, imprisoned in a sort of cosmic Phantom Zone. But the picture is almost stolen away from the others by the wonderfully talented Michael Pena as Luis, Scott�s partner and former cellmate. Pena is a genuine delight, almost unbearably funny especially during a scene when the bad guys inject his character with �truth serum� to extract some information�and then can�t shut him up. The product of no less than five writers, including Chris McKenna of television�s �Community� and �The Mindy Project� and star Paul Rudd, �Ant-Man and the Wasp,� although certainly not a classic, is non-stop fun, filled with dazzling special effects, dizzying stuntwork, and daring car chases. It�s actually more in the tradition of Disney�s live-action films of the 1960s than the current palette of existential Marvel ruminations�although mid-credit scene at the picture�s end brings the characters up-to-date with the events depicted in �Avengers: Infinity War,� and sets up the inevitable sequel. As is the case with most collaborations between Disney and Marvel so far, �Ant-Man and the Wasp� is expected to earn enormous amounts of money at the box office�some sources place the expected global total as high as $155 million over the opening weekend alone. Critical response has also been high, with Rotten Tomatoes reporting an 86% approval rating and Metacritic reporting a similar 70%. Exit audiences polled by CinemaScore assign the picture a final grade of A-minus, slightly less than the A grade earned by �Ant-Man� in 2015. �Ant-Man and the Wasp� is rated PG-13 for its comic book violence, and some rude humor which kids might need to explain to their bewildered parents.